And the catch of this melting season goes to Patrick Lockerby, having spotted something very spectacular indeed between the blanket of clouds. I take my sombrero off to you, sir! Glaciologist Mauri Pelto predicted it in the comment section of the previous animation I made of the sea ice breaking off in front of the floating ice tongue of Petermann Glacier: "I do expect a notable calving retreat this summer." I'll be updating this image the coming days. Read all about it over at Patrick's blog. As I noted over in the other thread ... The main lump is 250 km2. 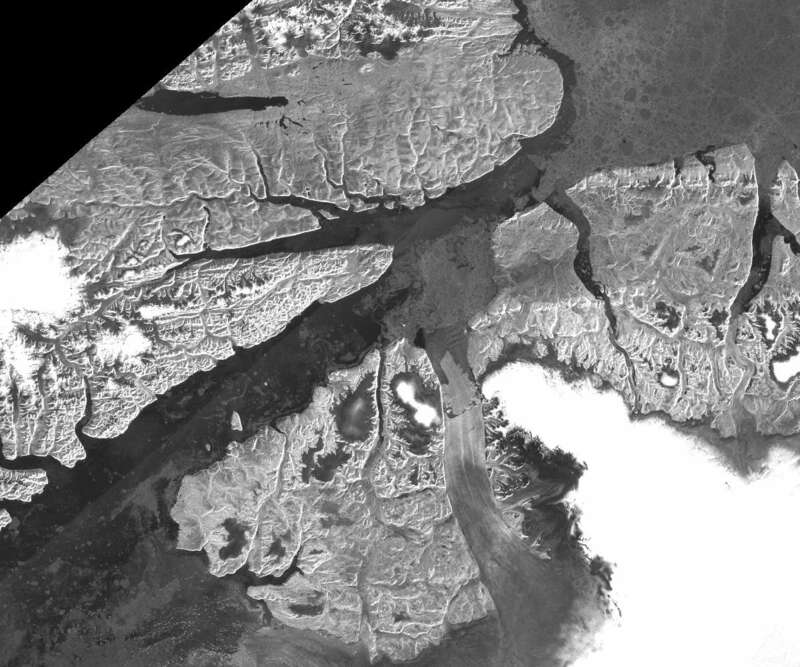 There's an additional 20km2 diffuse white patch between the main piece and the west shore of the fjord, which may or may not be attached to the shore and/or the floating ice. There's probably an additional 10 km2 or so of loose ice floating around the margins. So, somewhere in the range of 250 to 280 km2. If the floating tongue is around 65 m thick, that would make this around 16-18 km3 of ice, or 15 to 17 gigatonnes. Isn't the annual negative mass balance for all of Greenland somewhere around 280 GT recently? So this iceberg would be equivalent to 5% of that! Wow. I saw an article on Sky a few days ago quoting some scientists up on the ice sheet just now that Jakobshavn had experienced considerable loss this summer, including a one mile retreat on July 6-7. Hopefully someone more familiar with sat photo resources than I am can have a look at that. The article also mentioned that the scientists had observed a 6-meter thinning of the ice sheet during July in the area where they're working (somewhat to the south of Jakobshavn). That *sounds* notable, but I don't know how it compares with prior measurements. Steve, I have written an article and made an animation about that event a few weeks back. So, if I understand things correct, the Petermann Glacier Fjord empties directly into the Nares strait. the ice tongue was 70 x 15 km. That works out to 1050 km2. So, the 250 km2 that the first commenter quoted would be about a quarter of the tongue or maybe 15x15 km2. I guess the tongue is now only about 55 x 15 km. Thanks, Neven. I had forgotten. "Other fragments" includes the largish tongue to the right, I'm not entirely sure whether that has detatched, but if it hasn't I'll bet it does soon. I didn't count the tongue on the left, which I'm fairly sure is still attached. I also note a large crack on the right, about 4 - 5 km's back from what is not the tip of the glacier (just level with the second "tributary" glacier), so there could be some more action before the season ends. FrankD, try the Bands 3-6-7 image with vector coastlines to boot... Cheers, mate. siili: that's a very striking image. Thanks for the link. FrankD: good numbers. When I spotted this I was in a hurry to write up a scoop. Also I was still drained from a 2-day migraine. That's why I just went for the WAG method 300km round figure. Not too bad a guess, as it turns out. I think there is a bit more calving to come short-term. When a material fractures like that, there is a lot of shock transmitted into the ice masses. I would expect the new calving front to 'clean itself up' by calving a few relatively small bergs - about 15 or 20 sq. km. worth. The 'one to watch' now is the big fissure further back. I'll be looking at that as close as I can with available satellite images. What matters now is transverse compression - how well 'glued' that ice tongue is to the fjord sides. The chunk that just set sail for Boston Harbor had zero transverse compression when the last bit of sea ice melted. Neven: I just want to say publicly what I've said privately - this is a great blog. You can tell the quality of a science blog by the quality of the comments - and the fact that the people commenting have a lot of smarts. Always a pleasure Patrick, DMI has similar coverage of all the Greenland coast if you are looking for more action in cloudy skies. And if you as a MODIS reporter have some input on my precious "pink clouds" i would be most interested. That high-pressure system is still forecasted to move in on Monday, so hopefully we'll have a clearer view of the Canadian Archipelago from then onwards. ...and meanwhile the CCGS Amundsen is steaming through the East entrance to the NW Passage, Lancaster Sound. Water temp is still +2.7 C.
They don't have a mastcam, have they? Any thoughts on the ice the Healy encountered, dosn't look like much freeboard left to my very inexperienced eyes? This should be that 5+ years ice right? The Healy's position (as per the top of the webcam image) puts them smack in your pink clouds, siili and < 15% conc. on the sat icemaps. Amundsen has a WX stn, and a homepage http://www.amundsen.ulaval.ca/ but no webcam. Yes, about 30' away right, that should be about 1.25cm in your Terra (isn't AMSR-E on Aqua?) image, where according to my (not very clearly outspoken defenition, i agree) the cloud is both thin and white, you can even see the ice below. A pink cloud is centred about 8cm (i hope you can follow my units) NW of Barrow, where you can see absolutely nothing below it. The CCGS Amundsen does supply runs to local communities in the Canadian Arctic, while doing Ocean Science of the way. I occasionally get photos back from this ship, but it probably wont be until fall. The CCGS Louis St-Laurant is one of our Heavy Icebreakers, while the CCGS Amunsden is only a medium class ice breaker. The CCGS Louis St-Laurant will be doing tag team ice breaking with the US Healy in the high arctic this number. One vessel will be ice breaking while the other will be sounding and sidescan of the ocean bottom thru the leads created by the icebreaker. This will be the third year that we have done this. The blog is out of date, but explains the program. Fortunately, the Healy has a webcam and the hourly images can be found here; complete with Lat and Long. Over the next month, we will have feet on the ground visuals of the ice conditions in the high arctic. When I get back to the office in a week or so, I will see if I can find the track plots they have planned; but I believe they are heading past 80 North on the Western side of Canadian Archipelago. I will mention about webcams on our Coast Guard ships, but im sure our IT people won't like the concept of public facing live webcams. Neven, you may want to add the Healy's webcam site to your list of info resources. Lord Soth, you must have read my mind a bit. I might do a short piece on all those scientific ice breakers in the Arctic, such as the Healy or the Amundsen. Thanks for that webcam. I'll add it to the websites to monitor blog post. Too bad they don't have a live/updated image. I could have added it to the Arctic sea ice graphs page. BTW, many people here probably already know this, but a casual viewer of the Jakobshavn animation may be very confused about where the calving front is. All that white stuff in the fjord is made of bergs that have already calved. See http://maps.grida.no/go/graphic/jakobshavn-isbrae-and-ice-fjord-showing-locations-of-the-calving-ice-front-in-years-from-1851-to-2006-together-with-flow-velocity-observations for a more detailed explanation. You have to figure that the ocean is now undercutting the glacier in a region where the ground slopes *down* the further "inland" you go. At least the long fjord and all the ice in it can cool that water. If bergs were transported out of the fjord faster the glacier would retreat faster. Neven, how about replacing the dead NOAA NetCam #1 with the Healy's CrowCam? siili - not sure what you mean by pink clouds. Could this be a reference to the clouds of smoke and pollution coming from the Siberian fires? They do look a bit pink in some images. Greg Wellman, you're right. I should have linked to my previous post on Jakobshavn. Thanks for bringing it to my attention. I salute you Patrick for your honesty and valour, trying to keep at least a bit a dignity in this horrid world of hours. I thank you for your interest in my simple question. What i mean by "pink clouds" is the type of clouds which have been all too abundant the last couple of days, hindering the correct intepretation of ice extent and especially area. They are so opaqe in visual ,and brilliantly white, that you see no hint of ice below. In the infrared passband of Terra, they appear sort of "pink" hence my name for them. It is very clear in the last couple of days if you correlate areas in passive microwave images with artificially high concentration of ice , to the type of clouds in the same Aqua pass of the same area they match. My simple thought was that this was due to high clouds with icecrystalls in them which would give the impression of solid ice to the detector, but i would prefere your take on the subject. I should have *remembered* your previous post on Jakobshavn - it explained everything. BTW, it would appear that I was wrong about seawater being able to reach the interior basin. While the interior basin has places that are well below sea level (300m, according to wikipedia), there is no place where there is a channel below sea level between the interior and the exterior. 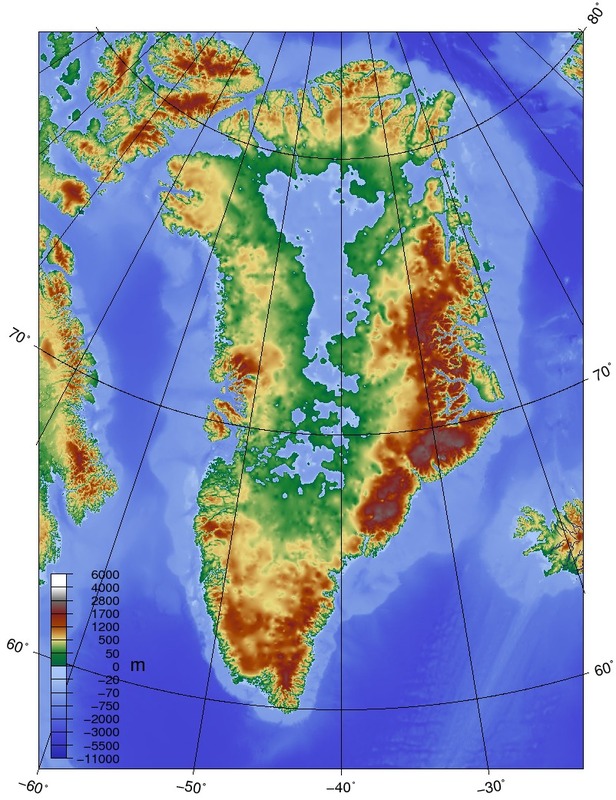 See http://upload.wikimedia.org/wikipedia/commons/8/8b/Topographic_map_of_Greenland_bedrock.jpg However both Jakobshavn and Peterman come rather close, with bedrock height below 50m for both. Greg, thanks a lot for the Greenland bedrock map! I've long waited for that (last time I looked it wasn't in wikipedia). I've also been worried a little by this seawater intrusion scenario. But then, the ice sheet should be heavy enough to keep grounded. And then again, perhaps these 50m barriers make things worse: Meltwater accumulating in the interior rock bottom, and then getting squeezed out? What is the temperature down there in the middle? There is an article on the Guardian about the Arctic. Thanks to Neven for this article and to Patrick and Mauri for the info on the Petermann. Been posting links to there blogs on the Gruan article. Another article about Greenland in the UK press, in the Daily Mail of all places. This is likely to be pretty influential on public opinion in the UK: the Mail is a very widely-read paper by the conservative (and Conservative) public, and has been a ghastly cheerleader of inactivism for many years. Potholer54 who did a video series on global warming had some pretty caustic witticism directed at the Daily Fail. Turns out he used to be a science corrospondent with them. I think the Russian heatwave and other weather events plus the relentless heating means it is time for a repositioning of the Fails position on AGW to more openly luke warmist instead of ambivelant (it does not cause cancer). You know, it's rather remarkable how little attention has been given to 2010 global temps. I hear a bit of denialist cherry-picking bs from time to time, and there's been a mention or two of the fact that we've now seen the warmest 12 calendar months in the instrumental record--but not much in the mainstream, on balance. Yet even now, with the sun still relatively quiet and the El Nino transitioned fully into La Nina, the UAH near surface channel is still tracking above 2009--and now it's tracking above 1998, too, as the latter part of that year was not so spectacularly warm.